The government's plans for reducing the budget deficit are not ambitious enough - according to a European Commission report to be published on Wednesday. The report warns that the UK is not on course to cut its deficit in line with EU rules by a deadline of 2015. Chief Secretary to the Treasury Liam Byrne said the report was "wrong" and would mean £20bn more in spending cuts. Ministers insist their plans to halve the deficit in four years are less likely to halt the economic recovery. In an interview with the BBC, Mr Byrne said the spending cuts and tax rises required to meet the EU target would cause "irreparable damage" to the economy. 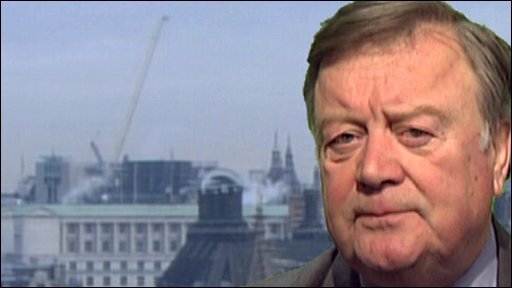 Shadow business secretary Ken Clarke, also speaking to the BBC, said the EU was right and the government needed to cut spending more rapidly, which could be done easily. Ken Clarke: "Start cutting spending now"
He said the UK needed to cut its deficit or "interest rates will rise, unemployment will rise and there will be no economic recovery". Liberal Democrat Treasury spokesman Vince Cable said the European Commission report was a blow to the government and its handling of the economy. "Gordon Brown has set great store by leadership of the international community on the economic crisis, so when leading institutions in the international community start criticising the way he is going about economic management then that is humiliating, frankly," he added. EU rules say government deficits must be below 3% of GDP, but the UK's deficit is expected to hit £178bn - or 12.6% of GDP - this year. Labour's plans, announced in the pre-Budget report, would see the UK's deficit reduced to 4.7% by 2015 - missing the EU target outlined by finance ministers last year. 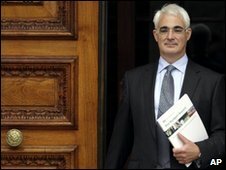 In the run-up to next week's Budget, Chancellor Alistair Darling has defended the government's approach to the deficit, arguing that cutting it too quickly by reducing government spending would risk harming the UK's emergence from recession. The European Commission is set to enter the argument over one of the key fault lines in British politics - the country's deficit. Britain is not in the eurozone, but the Commission will make it clear that under economic stability rules, the UK is expected to trim its deficit to 3% by 2014. The British Treasury says the government has already set out an ambitious plan to halve the deficit in four years, but the Commission thinks this target may be missed because growth could be lower than forecast. One official told us that "Britain is being too optimistic about its chances of recovery. It thinks it will be able to come out of this quicker than we think it will." "The chancellor's judgement on the pace of this adjustment takes into account the need to support the economy through the early stages of the recovery," a Treasury spokesman said. "To withdraw support earlier and at the wrong pace risks wrecking the recovery - a judgement supported by the Commission." The Treasury said the government's plan was the sharpest and fastest deficit reduction proposal in the G7 leading industrial nations. But the Liberal Democrats said that to be credible, parties needed to show what they would cut. A draft of the Commission's report suggests that "additional fiscal tightening measures" beyond those already planned are needed if the health of public finances is to be restored "within a credible timeframe". The report also calls into question the Treasury's forecasts for the UK's economic growth. Its forecast of 2% growth in 2010-11, and then 3.3% growth for the next four years could prove optimistic, the Commission argues, should the global economy fail to recover as strongly as expected. "The message from the Commission will be that the UK needs to get its house in order," an EU official said. The shadow chancellor, George Osborne, said a change of government was needed to restore confidence in the UK economy. He added: "The Conservatives have been arguing that we need to reduce our record budget deficit more quickly in order to support the recovery." BBC political correspondent Ross Hawkins said the European Commission had walked "slap bang into the middle of an enormous political row". He said the issue of whether to cut "sooner or deeper" would play "at the heart" of the forthcoming election as each parties' plans were scrutinised. "All the competing parties say they've got the answer and their opponents are misreading the situation," he said. The timing meant the topic had far greater impact than it would otherwise, he added. Budget calculator: Will your wallet feel lighter in 2010/11? How has the Budget affected you?